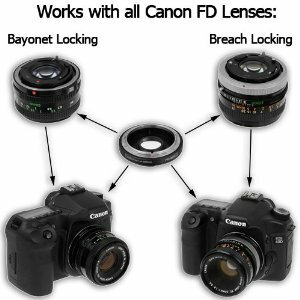 To use these lenses with your Canon EOS camera you will need an adaptor. I had heard bad things about the cheapo adaptors so I picked up the Fotodiox FD to EOS for $30 which works great. I have already dropped it and it took it well. QuickTime File: DSLR Video Shooter Episode #011. Can you pls send the ebay links of where you actually purchased the lenses. Thank you very very much sir!! That would be very helpful. I do not want to make a mistake on the purchase. They have a list of “top sellers”, and in there is a 50mm F1.8 in Excellent condition for $15. They’ve got a huge selection too. I got my Nikon AI Series primes through this site. So, the widest aperture makes the image soft? I have a 50mm 1.4, 28mm 2.8 and the image is soft except when I’m focusing very close. I guess, I’ll try closing the iris. Any thoughts on the old nikon with adapters? I heard it’s better to go with old nikon than old canon. I’m waiting on my adapter and lens (55mm 1.2) to arrive. I’ll let you know the results as soon I get them! Yes, I have found them to be softer wide open. I really dig Nikkor lenses with F-EOS adapters. Actually this podcast was shot with a nikkor 35mm F2.8. They don’t have as many cons (crop, soft, light loss etc), but are often much more expensive. I have the Nikkor 50mm F1.4 on the way here too. And these FDs have their own unique optical aesthetic. You probably notice their very different contrast level than other lenses. And they react differently to lens flare. Just one more optical wrench for the filmmakers tool box. Keep me posted on you 55 F1.2. Thats pretty fast! Wait, I’m not sure if I’m understanding this correctly. I can use old nikkor lenses on my canon with the adaptor that you mentioned above on the link? If so, which Nikon lenses? I’m so thankful for this blog entry! I feel like you’ve opened up a whole new world to me. Thanks for the link for that reputable website Ryan. So, forgive me for my math or stupidity, if you were to put this lens on a eos camera (T2i 550d for example) that already has a crop factor of 1.6, then the overall crop would be close to 3?? @Ryan Hall, Did you tell me about Keh.com before? I ordered a lens from them last week. Super great resource for finding lenses. Between Ebay and them I can find just about anything! Sorry, I just watched the video, question answered thanks. @Caleb, I might have, maybe on the Facebook page. Yea they are a great site, what you order is what you get. I am also a huge fan of my Nikon lenses. @calebpike great, informative video caleb, thanks! This week I was looking for some HD Samples of some FD Lenses mounted on a HDSLR. Today I was sitting in the bus and took my Iphone to view some new Podcast. Bammmmm, there was this well done video from you, thanks a lot! Ha ha awesome! Were you viewing it on iTunes? The Vimeo version is MUCH higher quality. @Caleb..I watched the Nikon podcast. Does it work the same like Canon regarding crop factors and light lost like how you explained the Canon FD in this blog? Do all Nikon lenses fit with the Cinevate adapters or just old Nikons? Thanks. There is no crop factor with the Nikon/Nikkor lenses. The adapter fits all F-mount (nikon) lenses old and new. Thanks Caleb. I have a Canon AE1 with a few of these lens so this video is timely. Very well explained. I’m getting into vlog’ing and your vids are an inspiration. Awesome vid man, thanks for that knowledge! Also, your pans at the end of the video were beautifully smooth, what tripod/techniques you using? Great video, just wondering if you had any thoughts on the FL lenses 50mm f1.4 in particular. I am afraid I have not worked with that lens. I bought this adaptor on your recommendation. 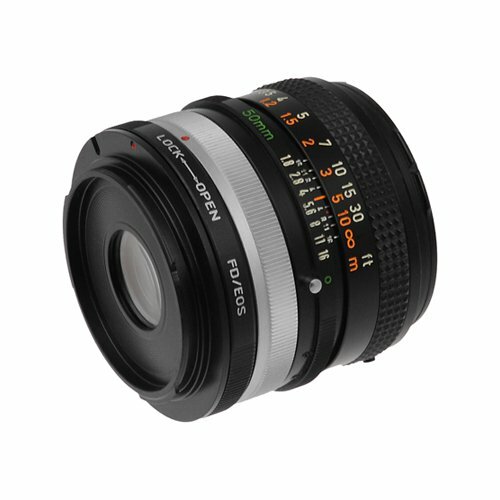 Ok, so are there more expensive FD lens adapters than the Fotodiox one? Someone commented that the quality of the adapter really affects the image and softening. Also, so there is NO crop factor when using FD Nikon lenses on the 5D with an adapter? With which adapter. Hey Jon, There is a more expensive ($50) adapter out there. I have not tried it. All I know if the Fotodiox version works great for me and fits several different types of FD mounts. And yes. There is no crop factor when using Nikon lenses on your 5D. Is there any way to correct the softness when the lenses are wide open without buying a more expensive adapter? I’m using a 50mm f/1.8 where the softness is particularly bad and a 70-210 f/4 where its almost nonexistent. Just picked up a 135mm FD (and your recommended adapter – very nice) and my pics are quite beautiful. Thanks for this great and informative post! Love this site. “the softening is a 100% flaw from the adapter design who targeted the mass produced f2.8 lenses with a tight aperture. less common primes with faster glass wide opened suffer from ghosting and halos due to light being reflected back into the lens by the adapter’s smaller relay optical opening. I am looking into other adaptors that are not as cheap, but so far all suffer from softness wide open. I think I am going to try and round up some of these F Nikon lenses for use on a 5D. I like the low price, and the look of the image is great. One question though, did you know Philip Bloom does not recommend FD lenses due to the sharpness issue? Any thoughts on that? Personally, just judging from the sample footage in the podcast, I think the sharpness is fine. Did you just add extra sharpness in FCP for some of the comparison shots? Also, I’d like to hear your thoughts on an inexpensive follow focus setup. Thats what I would do. I am also slowly collecting a set of old Nikkor primes as well. They are great. Still affordable but not as cheap as the FDs. Yeah I knew Bloom wasn’t impressed with FDs. But what I think he is missing, is that optics aren’t all about perfection in their geometry. Every lens has a unique characteristic. Color temps, how they respond to flare, their bokeh and these FD lenses are no different. Just because they are not sharp (get around this by stopping down/adding sharpness), doesn’t render them useless in my mind. Would I use these lenses on every project? No of course not. Nor would I any lens. But the greatest thing about these lenses, is that they give the masses a chance to CHOOSE lenses. Someone could by 5 of these and begin to experiment with lens compression and other aspects they otherwise would not have had the opportunity to try. I only added sharpness once, and I stated so in the podcast. All the footage at the end has no sharpless added. D-Focus is the bomb for a starters (great price too). just got a 50mm 1.8 for about $15 thanks to you! love this little setup! thanks a lot for showing this video. keep up the good work! A 200mm f/2.8 would behave like a 250mm f/3.5 correct? And a 300 f/4 would behave like a 375 f/5? As for the crop, are you on a 5D or APS-C sensor? I just watched your video. Those images were lovely. The images certainly did have a “vintage character,” and it was wonderful. Your tilt up to the water spigot produced the most beautiful lens flare. Hello! Thank you for your excellent video (and site) ! You added sharpness on post pro on one shoot. Can you give any details on that? What software did you use, and what settings do we have to look for? I use FCP’s “Sharpen” effect. Thanks for this excellent video. I would be very interested in finding out how you did the post production work on image sharpness. Can you give us some advises on that? I will try to do a quick screen cast this weekend. Thanks for the cost saving tips and demp. I have watched this with greate pleasure. tnx! Thanks! That would be great!! Awesome video! Thanks for the info, very helpful! What was the music called at the end of the video? Music was by El Ten Eleven I think.. Anyone recommend an adapter other than the fotodiox which I’m struggling to get in the UK. As for Philip Bloom’s comments that’s understandable as he doesn’t seem to be interested in doing stuff cheaply. Got the Fotodiox today. Put it on the FD 50 1.8 that I have. It fits and seems to work on the camera, except I can’t control the aperature. Once I lock it on the lens it’s wide open. Am I missing a piece? At 8:00 you show a silver ring that you use to lock the adapter to. I don’t have that piece. Thanks! Hey Caleb, my lenses are the bayonet style. Just more info from my previous post. Did you follow the instructions for using it in the video? 2. Put on the adapter and the lens ring should unlock and you can tighten it to the adapter. Do note that the aperture ring should not work when it is not attached to the lens. A few times I have not properly locked the lens before adding the adaptor and I had this same problem. No, but even when I did I was over tightening it until it clicked and it would be wide open. If I lock the adapter, put it on an turn it the same amount I would with a cap it works like a charm! I showed my Father-in-law who is in town and he said he a a bag full that I could have as well. Double Score! I was curious if anybody knows if there is a lens adapter for a Mamiya-Sekor E 28mm/2.8 lens i have laying around. I’ve been browsing the web, but can’t find anything. It would be awesome if I could use these old SLR lenses on my 7D! have u used any of the vivitar fd mount lens? but unfortunately the aperture doesn’t work. i followed every step u said but it doesn’t work. sadface. Great vid. Just wondering if that adapter would work on a manual Sigma lens? Is not, which would you recommend (if any) for Sigma lenses? Just as long as the Sigma lens has an FD mount then it will work. This stuff is great. After watching this, I found a handful of pentax PK mount lenses in my house, and got a few for free from people I knew. Purchased a $10 adapter and now I’ve got 5 more lenses to add to my kit. 2 50mm f2’s, 28mm f2.8, 70mm-210mm f4.5, and a 75-200mm f4.5. All for the great low price of $0. I’ve got a handful of FD lenses on there way from Ebay. I’m about to buy a Canon FD 50mm F1.8, but have one question before ordering the lens and the adapter. You have mounted a locking ring on the lens, is this locking ring also included with the adapter? The adapter I link to is all you need to mount you FD. Very informative video, straight to the point. There are so many misinformation about this on the internet, it’s frustrating. I’m not interested in video shooting, I ended up in here because I’m looking for cheap alternatives to longer range lens (only have the kit lens ATM). I was thinking about getting one of those cheap 200 or 300mm zooms like the one in the video, but I’m starting to think that I’ll just end up with medium-low quality pictures. I could do a bit of bird photography, many birds hang around near by my balcony, but I’m not really thinking about spending the money a ‘proper’ long range lens. 400+ euro on a lens… I hate to sound cheap, but many simply can’t afford that. Caleb, you only showed the tip of the iceberg regarding photography which is natural given the purpose of this website. But could you show some samples maybe? Or maybe link to some if you know any. I own three manual lenses myself, not FD lenses, but M42 lenses, which I use for video. There are many different brands with this mound (my lenses are Auto Chinon). Most of them have great build quality and if you’re lucky, they are great optically too. Manual focus with my Auto Chinon 55mm f1.7 is so much easier than with Canon’s ‘nifty fifty’ and is cost just $30, adapter included! Why do I prefer M42 lenses above FD lenses? The adapter is very cheap (a couple of bucks), and there is no glass in it, so the original optical quality of the lens is not degraded. what is the lowest focal length you guys have seen being sold for an FD lens? Ive only seen 50mm. There are wider lenses out there. But they get a little pricey. So if you need wide you might want to look for a non-FD lens. Thanks. This was a very helpful summary of the issue of adapting FD lenses to EOS cameras with the pros and cons. You may already know this, but I just wanted to clarify in case not. The “Lock – Open” ring on the adapter is for stopping down the aperture of the lens; it has nothing to do with connecting the lens to the adapter. To control the aperture, twist the ring to the open position, connect the lens, then twist the ring to the lock position. Now your aperture works. Hope this helps to clarify the purpose of the locking ring on the adapter. God bless. Fantastic post! Already using my new (old) fd 50mm on my 7d. Thanks! Quick question do know if macro lenses will work with this? I was thinking of buying a tokina 90mm 2.8 for fd canon mount. Any thoughts? Yes I have. Great little lenses. When you were reviewing the fd 50mm 1.8 and you tested out some video shots were you close up to the objects or far away then zoomed in? I honestly couldn’t tell you since it has been so long! Probably a mix of both.